Russia's Defense Minister Sergei Shoigu on Tuesday said the country must develop new types of missile systems in the next two years after Washington and Moscow ripped up a key arms control treaty. The United States has repeatedly accused Russia of violating the Intermediate-Range Nuclear Forces (INF) agreement and on Friday President Donald Trump said Washington was starting the process of withdrawing from the treaty in six months. Many analysts say abandoning the 1987 treaty could effectively signal the start of a new arms race. 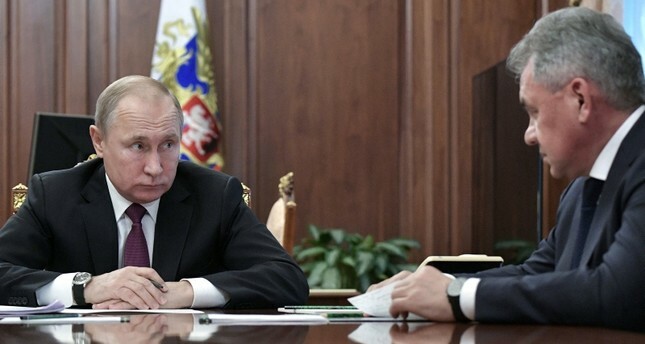 At a meeting with officials on Tuesday, Shoigu said Russia should develop two new missile systems in the next two years. "During 2019-2020 we have to develop a land-based version of the seaborne Kalibr system equipped with a long-range cruise missile which showed good results in Syria," Shoigu told defense officials. "Over the same period we will also have to create a land-based missile system with a long-range hypersonic missile," he said. The defense minister said the plans had been approved by Putin. The INF agreement forbids ground-launched, short- and intermediate-range missiles, but not those launched from the air or sea. Defense experts say converting seaborne and air-launched missile systems for ground use will be advantageous for Russia since producing such missiles will be cheaper and quicker. "The use of seaborne and air-launched missiles will allow us to significantly reduce the time needed to produce the new missiles as well as financing for them," Shoigu said. He also tasked defense officials with extending the maximum range of ground-based missiles "that are being developed today." Defense experts say because ground-based intermediate-range missiles are cheaper, Russia could theoretically place more of them within range of European targets. Speaking to Shoigu on Saturday, Putin said Russia would not put any such missile "in Europe or other regions of the world" unless the U.S. did so first. The INF treaty was signed in 1987 by then U.S. President Ronald Reagan and Soviet leader Mikhail Gorbachev. The last nuclear arms control treaty between Washington and Moscow — the NEW START treaty — expires in 2021. Most analysts expect it will not be extended.